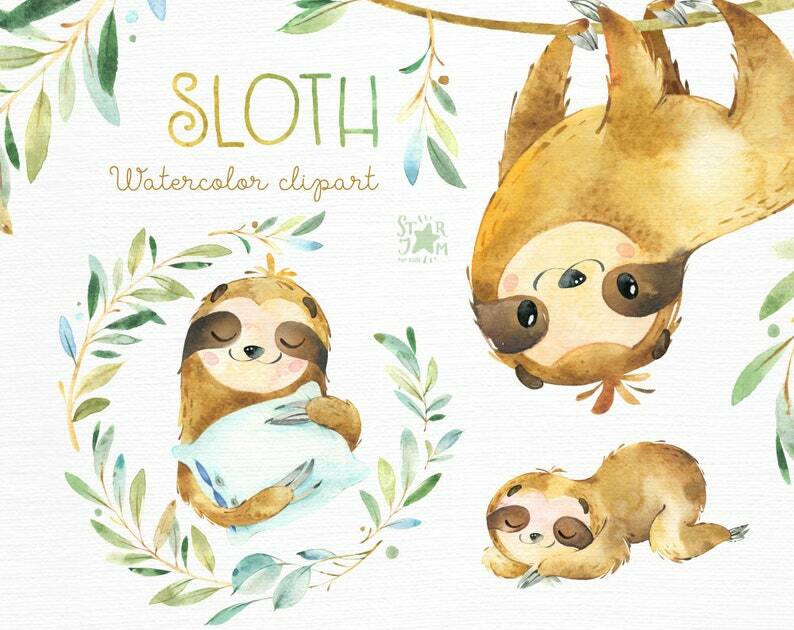 This Sloth animal set includes sloths, wreath and florals. It is just what you needed for the perfect invitations, craft projects, paper products, party decorations, printable, greetings cards, posters, stationery, scrapbooking, stickers, t-shirts, baby clothes, web designs and much more. You can use our artworks on personal or non-profit projects without our commercial license and credit as long as NO MONEY is made. - If you have a small or home-based business and shop on ETSY, you can use any of the images you purchase in our shop in your products to sell (Only for Etsy shops). Credit needs to be placed in your product description, on the same page as the product in an easily readable fashion. - Note! the graphics may not be used as is, in a stand alone fashion, but rather needs to form part of a new design that incorporates other resources, graphics and/or text. If you plan to manufacture an item with our design in excess of 1000 pieces/copies, please contact us for a mass distribution license. Once payment is complete, digital files will be available for download in your etsy account and an email will be sent to your Etsy registered email. You CANNOT redistribute any artworks by StarJamforKids as clipart or claim the item as your own for resale. You CANNOT deconstruct the graphic, combine with other graphic, repackage and resell as digital clipart. Get 25% off your order when you spend $50 at this shop. Discount shown at checkout. Absolutely adorable. Files were perfect. Thanks! PayPal. You can using a card through PayPal without having a PayPal account. Please, notice! If your payment method is eCheck, it could take 3 to 5 business days for the payment to clear, then you can download these files from your etsy account. If you pay by PayPal with a credit card or PayPal balance usually will it clear immediately. There is no refund for digital goods, once your files have been downloaded from your Etsy account. Please read the information provided in the listing about the format and file types before buying. If you receive a damaged file, I will gladly exchange it for a new one. StarJamforKids reserves the right to modify this Agreement at any time without giving you prior notice. By purchasing StarJamforKids artwork, you are granted non-exclusive, non-transferable, revocable, one-person license to use StarJamforKids artwork. All rights, title, interest, copyrights and intellectual rights are retained by StarJamforKids. You CANNOT redistribute any artworks by StarJamforKids as clipart or claim the item as your own for resale in any shape or form. You CANNOT deconstruct the graphic, combine with other graphic, repackage and resell as digital clipart. You can use our artworks on personal and non-profit projects without our commercial license and credit as long as NO MONEY is made. Personal use projects cannot be related to any business, non-profit, or other organization of any kind.